This is the most useful icon and will allow you to select a place on a track. With this cursor you can play a track from a particular point by clicking on the moment in the track, but you can also highlight sections of a track to delete, or cut, and move. This should be the tool which you have selected as standard. Always remember to click back onto the selection tool after enveloping, zooming or shifting, otherwise you will continue to edit your track and destroy the perfect design you have achieved! Allows you to adjust the volume (so to fade in / fade out) sections of the track. This is particularly useful at the beginning and end of an audio - visual piece, but may also be a handy tool when a sound effect track is used allowing you to give a sense of depth, i.e. to footsteps that are gradually getting louder or a train that is pulling away. 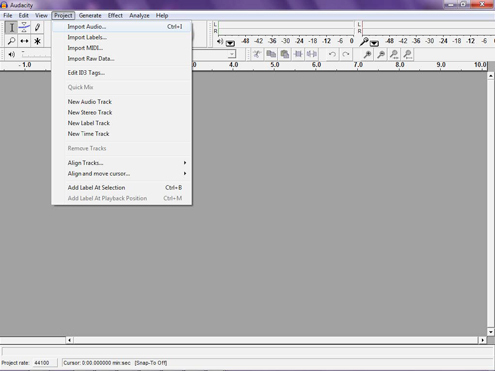 The Draw Tool is only specifically useful for editing samples of a sound effect. This is more likely to be used if you have created your own music / sound effects or are using short samples. The Zoom Tool will help you to find the exact point at which you want to cut a sample. Specificity is important in sound design to prevent music or sound effects cutting too abruptly which sounds foreign to the ear and unnatural, thus will distract the audience from the diegesis.